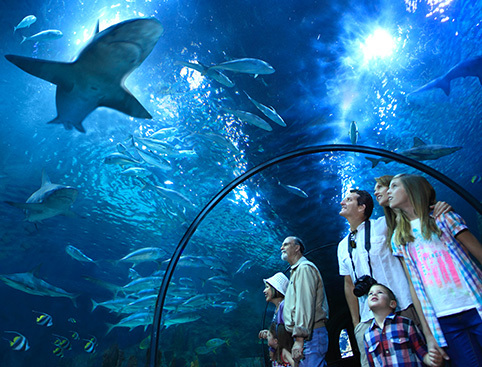 Visit both Siam Park and Loro Parque in Tenerife. Includes transport to Loro Parque from southern resorts. Click here to view the Loro Parque Bus Timetable. Transport is available from most southern resorts. Click here to view the Loro Parque Bus Timetable. Special Offer: receive a FREE €5 voucher per person to spend on food and drink inside the Park! Enjoy a full day’s admission to all of Loro Parque’s shows, wildlife habitats, playground, botanical gardens and more! Simply print off the e-ticket and present it when you arrive at Loro Parque! PLEASE NOTE - your €5 park cash voucher is only available for redemption at Bambú Bar outlet located in the Kinderlandia area at Loro Parque. Voucher can NOT be redeemed at any of the gift shops/merchandising outlets. This is a UK-exclusive ticket which can’t be purchased in-resort! This ticket can be used any time during your holiday! The Twin Ticket is valid over a 14-day period, so you don’t have to visit the 2 parks on consecutive days. The 14 days begin on the day that the ticket is first used. Simply print off the e-ticket and hand it over at the entrance to the first park you visit. Enjoy Tenerife’s two top attractions at one unbeatable price - and receive a FREE €10 voucher per person to spend at either park! The Twin Ticket is valid over a 14 day period, so you don’t need to visit the parks on consecutive days. The 14 days begin on the day that the ticket is first used. PLUS return transport to Loro Parque from southern resorts. Click here to view the Loro Parque Bus Timetable. Transport to Siam Park is available via a FREE bus service from Los Cristianos, Playa de Las Americas and Costa Adeje. Transport is available from several southern resorts. To reserve a seat, please call the number on your e-ticket when you arrive at your resort. If your hotel is not a main pick-up point as listed, you’ll be directed to the closest pick-up point to where you are staying. PLEASE NOTE – the transfer time to Loro Parque will be 1 hour and 30 minutes after last pick up point, dependant on traffic conditions. Transport to Loro Parque is available 3-5 days a week, depending on the season. Click here to view the Loro Parque Bus Timetable. Please print this and call the number provided once you arrive in Tenerife to arrange your transport. If your hotel is not a main pick-up point then you’ll be directed to the closest pick-up point to where you are staying. IMPORTANT: Please print 3 copies of your voucher. One must be handed to the driver for your outbound and return journeys. On arrival you’ll receive a ticket for lunch with your reserved time. Please Note: Discovery Tour times are usually 11am or 1:30pm. Depending on numbers more tours will be added throughout the day. Your day will be planned by your guide who will also reserve your show seats. Please arrive at the park by 9:30 to secure your preferred times. Don’t Miss: The mischief-making sea-lions in their very own show! Don’t leave Tenerife without a visit to Loro Parque, Winner of Tripadvisor Travellers' Choice 2018 Best Zoo in the World! Home to over 700 animals, an enormous aquarium, children's playgrounds, botanical gardens, spectacular shows and more, it's one of the Canary Islands’ biggest attractions! 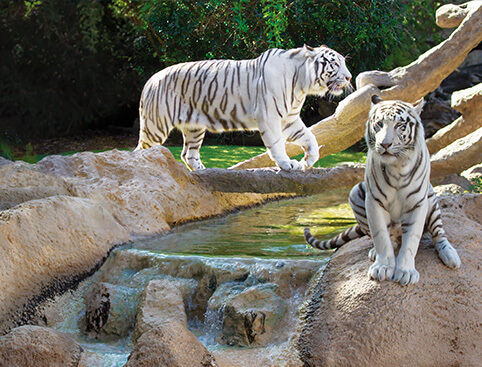 Whether you’re marvelling at the spectacular shows or exploring the wildlife habitats, you can’t fail to be astounded by the wonder of nature at this amazing wildlife park, which nestles in the hillside of Puerto de la Cruz. 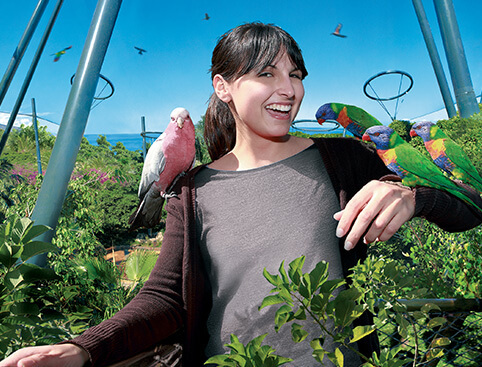 Loro Parque, which means “Parrot Park” in Spanish, lives up to its name with over 3000 colourful parrots from the most important parrot collection in the world. The park is home to over 700 animals of the land, sea and sky, with a vast aquarium which gets you up-close and cosy with piranhas, sharks and dolphins and the world’s biggest replica of the Antarctic, complete with icebergs, the perfect spot for the inhabitants of “Planet Penguin”. Don’t miss the amazing live shows featuring dolphins, orcas, sea-lions and parrots who’ll leave you in no doubt as to who are the real stars! Many of our Loro Parque tickets are exclusive to UK customers and can’t be purchased at the park. Some even include transport to the park from areas around Tenerife. And now you can enjoy double the fun with our Twin Ticket, which also includes admission to Europe’s biggest aquatic park - Siam Park! PLEASE NOTE - E-tickets must be printed. Tickets in digital format (smart phones or tablets) cannot be accepted. Open every day of the year from 8.30am to 6.45pm. Last entry is at 4pm. Avendida Loro Parque, Puerto de la Cruz, 38400, Tenerife. Loro Parque has over 200 parking spaces. A small fee is payable for daily parking. Children’s pushchairs can be rented at €5 per day. A passport or security deposit of €30 is required. An audio-guide is available for €3 for the day. A passport or security deposit of €40 is required. Wheelchair hire - manual wheelchairs are available for use free on a first come first served basis. A passport or security deposit of €30 will be required. Electric wheelchairs can be hired with an advance reservation for a fee of €12 per day. Accessibility for wheelchair users at Loro Parque is good. Easy access is available throughout the park, in adapted restrooms and in on-site cafes and restaurants. The park has plenty of good-value eateries, whether your fancy is for a burger, pizza, freshly-cut sandwich or delicious full-meal, there’ll be something to suit your palate! You’ll find everything you need to complete your day at the shops in Loro Parque, from souvenirs, sun-cream and sunglasses to animal-themed clothing and more! Children under 6-years-old enter for FREE and do not need a ticket. General admission to Loro Parque. Failure to do this may result in non confirmation of one or both reservations, resulting in issues upon arrival at the Park(s). Majestic orca whales are one of the icons of Loro Parque. Their incredible habitat, one of the most modern whale installations in the world, contains a staggering 22.5 million litres of sea water which is pumped directly from the Atlantic Ocean. The most touching part of Orca Ocean however, is witnessing the extraordinary bond between the trainers and their magnificent charges. A huge iceberg and real snow make Planet Penguin feel just like home to over 200 King, Gentoo, Chinstrap and Rockhopper penguins. Widely considered to be one of the best penguin habitats in the world, this impressive attraction is also the biggest Antarctic replica ever constructed. Watch in delight at the antics of these playful, intelligent creatures as their gravity-defying leaps and acrobatics reach heights of up to 6 metres! 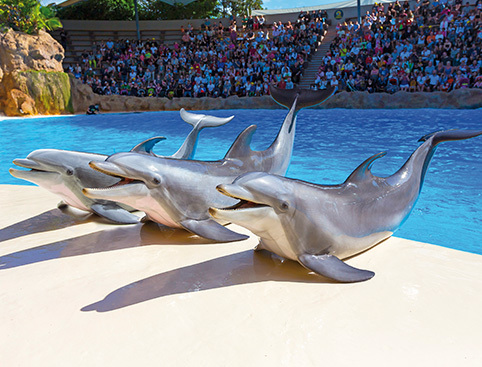 Like all the animals at Loro Parque, the dolphins in this beautiful dolphin habitat, which is modeled on a Caribbean lagoon, are kept healthy and happy by an army of caring helpers, vets and biologists. Sea Lions are known for their sense of fun and this comes across in spades in their very own show! The sea lion show includes a combination of ballet, games, balance and jumps, but in true sea-lion style, what they (and their audience) enjoy best is when they make mischief for their helpers! 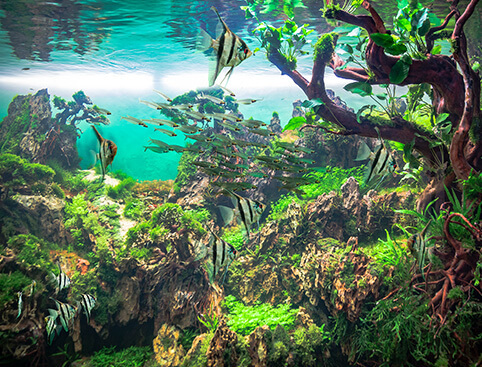 This massive aquarium, which contains 1,200,000 litres of water, includes seven different exhibits which recreate the ecosystems of different parts of the world. The true highlight of the aquarium however, is the 18m-long Shark Tunnel which’ll bring you face-to-face with these magnificent predators. Included in some of our Loro Parque tickets, the Discovery Tour lets you meet expert guides who share amusing anecdotes and behind-the-scenes stories about the animals and how they arrived at the park. During the two-hour tour, you’ll learn from the guides how cutting-edge technology is used to both better the lives of the animals and improve their habitats. Loro Parque is located in the north of Tenerife and is easily accessible from all parts of the island. If coming by car, take the TF1 motorway in the direction of Puerto de la Cruz, turn off at Exit 32 or 36 (either will do) and follow the signs to Loro Parque. There is also a fun, FREE express train service between Plaza Reyes Catolicos in Puerto de la Cruz and Loro Parque Tenerife. The train service begins at 9am and runs every 20 minutes until the last departure from Loro Parque at 6.45pm. A good public bus service operates from all parts of the island. From Santa Cruz take bus numbers 101, 102 and 103. From Playa de Las Americas, take bus numbers 343 or 381. Booking a ticket which includes transport? Some of our tickets include return transfers to Loro Parque from various resorts in Southern Tenerife. When you arrive in resort please call the number provided on your ticket to reserve your place on the bus. Click here to see the Loro Parque Bus Timetable. (Please note this may be subject to change). Loro Parque Tickets is rated 4.8 out of 5 by 209. Rated 5 out of 5 by Moonis from Superb! Had such a great time Such a big animal and marine park, couldn’t see it all with our little one who enjoyed soooo much!